The bed faces the work desk, which is another feature required by the owners, as they sometimes work from home. The placement of the desk within the wardrobe space signals the demarcation between the sleeping area and the work/dressing area. To tie the whole look together, the designers picked out a desk in similar wood tones to the flooring. Niki Bruce added this to How Do I... Use Dark Paint Colours in a Small Apartment? But we don’t have to restrict ourselves to this white-wall rule. 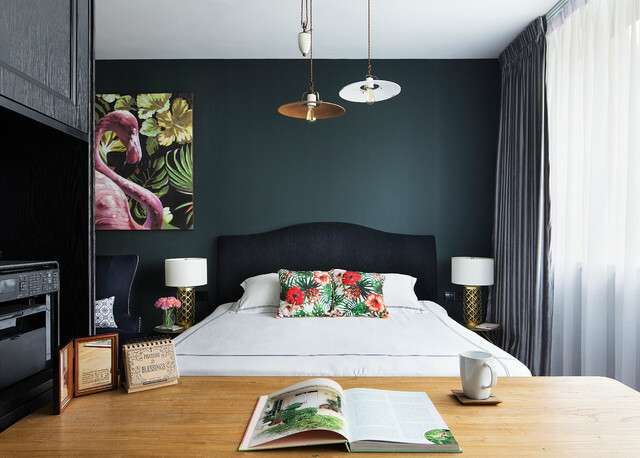 Darker, or stronger, paint colours can be used in small apartments, you just have to be brave and clever about how you use them.